The instrument has two complete Manuals; Compass of Great Organ from CC to F in alto; Compass of Swell Organ, from Tenor C to F in alto, and independent Pedal Organ, CCC to Tenor C.
The instrument is in every respect a credit to the makers. In the balance of tone, at once the most vital and difficult point in the construction of the an Organ, Messrs. Bishop and Starr have been most fortunate; for whilst the tone of the Great Organ is full, bold, powerful and crisp, there is nothing whatever of a harsh or noisy character about it. In 1920 the organ was re-built by George Fincham and Son, of Melbourne who extended the Swell to full compass and provided a new Tubular pneumatic action. The Dulciana on the Great was completed, a Celeste and Viol D’Orchestre added to the Swell and the Double Diapason altered to an eight ft. rank. The cost of the work was 435 pounds. The Organ was again re-built in 1963. This time the Launceston firm Davis and Laurie did the work, replacing the tubular pneumatic action with electro pneumatic action. 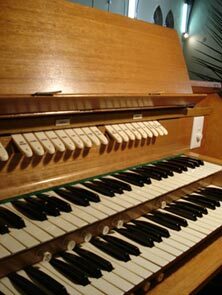 A new Salicional was added to the Great, and a Bourdon 16 ft (from St David’s Cathedral) was added to the Pedal Organ. 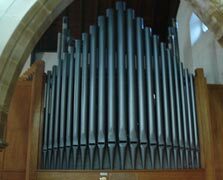 A bass flute was ‘borrowed’ from the extension of this, and the Octave 8 ft and Fifteenth 4 ft were ‘borrowed’ from the Open Diapason of the Great Organ. In 1974 it was moved to where the new organ stands now in the North Aisle by Hobart firm of Long, Langlois and Johnstone. New casing was provided and the console was rebuilt and detached.